Happy New Year's from Hanson Overhead-North Bay! 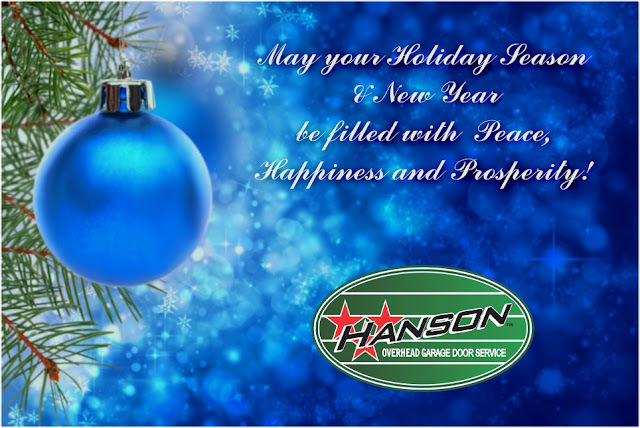 Hanson Overhead CYBER MONDAY Garage Door and Opener SPECIALS! Call today to schedule you FREE garage door and garage door opener estimate! Sometimes it's fun to share something positive. Thank you to everyone that takes the time to write reviews. Wayne-Dalton Garage Doors are synonymous with quality and performance. Did you know they are also available in numerous materials and over 6000 color choices? 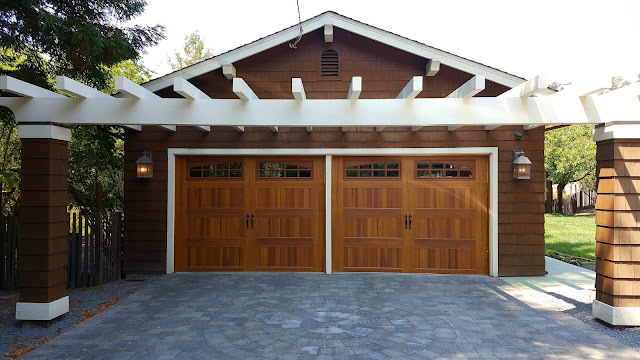 Hanson Overhead installed several wooden Wayne-Dalton garage doors on a beautiful home in Kenwood, CA this year. The Model 7411 - Belmont Design doors included squared glass top sections with 12 True Divided Lites windows. 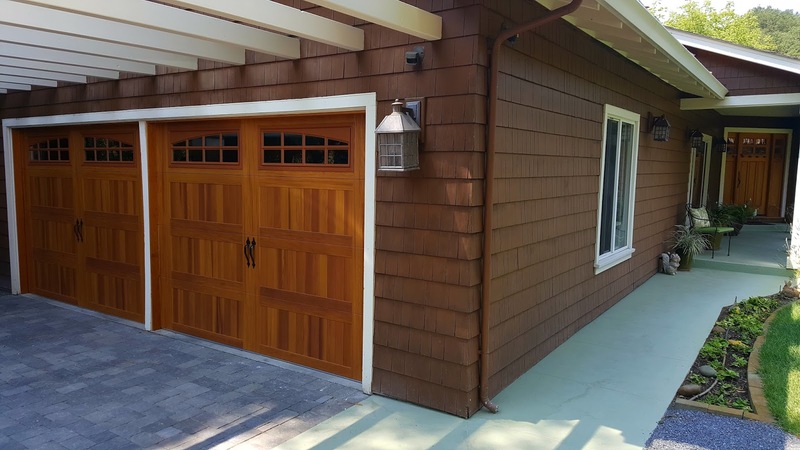 We worked with our clients to select garage doors that would accent their home design. Our technician painted the garage doors onsite prior to installation. The single-car door is actually non-operational, but is the home laundry. By the time our team had completed the project the new wooden garage doors looked like they had been a part of the original home construction. The Tubbs, Nuns and Atlas fires are still active in our service area, as over 10,000 fire fighters and emergency personnel have worked to protect our region. Our prayers continue for those that have lost so much during this tragic event. Many thanks go to First Responders for their diligence to save our community. All of our team is safe and have been camped out in our Cotati Office. At least one Hanson truck and technician home have been lost. We await news regarding other homes and property. Thank you for your prayers during these devastating fires. Recently, we were asked to match new garage doors to our client's beautiful wood front door. Yes, we are a garage door service and repair company. However, we are often inspired to capture the beauty and creativity found in the North Bay. Traditional Carriage House Doors could have been cost prohibitive for this project. We were able to match the front door with C.H.I. carriage style panel design doors. The cedar wood grain finish is a close match to the existing front door. Additional carefully selected features were the Arched Stockton Glass Design, Spade Decorative Hardware and custom stained 1"x4" wood cedar trim around each opening. The final result are professionally installed 9'x7' Model 5916 C.H.I. Garage Doors that complement the existing structure. 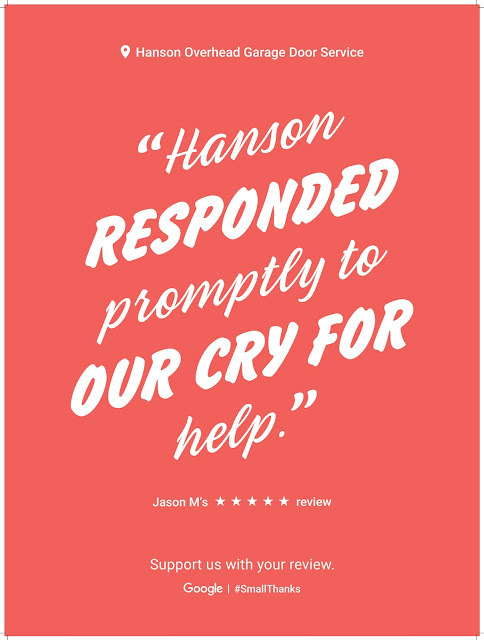 Call Hanson Overhead today for a budget friendly solution to your new custom garage door aspirations!